L-R Hawa Golakai, Kinyanjui Kombani and Richard Crompton. 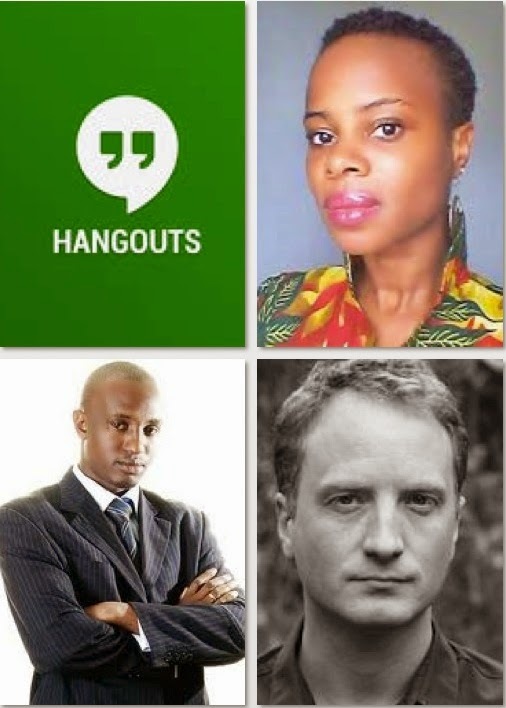 We here at JamesMurua.com would like to introduce a new thing in the African literature scene: The African Author Google Hangout. This is a hangout done to ensure that fans of African literature will be able to interact with their favourite authors from all over the continent. This is with the help of new technologies specifically Google Hangouts. Richard Crompton – The Hour of the Red God/ Hell’s Gate – my review of The Hour of the Red God. Hawa Golakai – The Lazarus effect – Official website with publisher and my review of her book. Kinyanjui Kombani – The Last Villains of Molo/ Den Inequities – Official author website and my review of The Last Villains of Molo and Den of Inequities. They will be logging onto the hangout to discuss crime and its sleuths. The discussions will include the following topics. Crime – What is crime to the author in their own spaces. How do people deal with it as a society? How has it affected the society you live in? Sherlock Holmes – How do authorities go about solving these crimes? Do we have our own Sherlock Holmes? Also who are your favourite crime solving characters- in African as well as world literature? Q&A – We then leave the session open to the audience who will then ask specific authors any burning questions. If you wish to join in the discussion you can ask questions of the authors on Twitter using either #AAGH #AfroCrimeFiction or even chat with the authors themselves on twitter. Download the Google hangout app on your computer and install it. More information will be available on the day of the hangout.